The Defence Forces team carried out a controlled explosion on a quantity of unstable Picric Acid in Kilmallock this morning. File photo of the Army Bomb Disposal Team in action. THE ARMY BOMB disposal team has carried out a controlled explosion on a quantity of unstable picric acid in Kilmallock, Co Limerick. The acid, which can crystallise and become unstable over time, is used in laboratories and was discovered at a retail premises during a routine check of chemicals on site. The Defence Forces team was called to the premises this morning and carried out a controlled explosion on the substance. The scene was declared safe at 11.40am. This is the team’s 118th call out so far this year and the sixth involving a ‘substance of concern’. 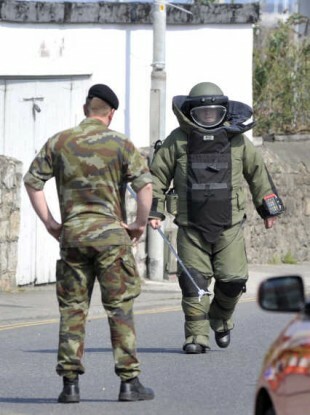 Email “Unstable acid made safe in Limerick by army bomb disposal team”. Feedback on “Unstable acid made safe in Limerick by army bomb disposal team”.